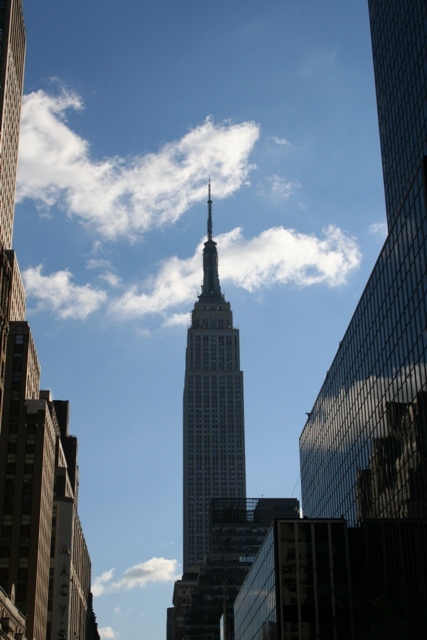 One of the New York skyline’s most famous landmarks, probably the most recognisable building in the USA and a tourist trap – the Empire State Building and I loved it. Once the world’s tallest building, it just has a certain je ne sais quoi – the height, the lines, the spire, those 102 storeys that rose from the ground over the course of barely more than a year – we just had to visit. The numbers are staggering – 1,450 feet high, 60,000 tonnes of steel and 6,500 windows (which somebody has to wash), the skyscraper was built in 410 days at a cost of $40 million during the Depression. I always think of it as the vertical perch from which King Kong was knocked! Some say the Chrysler Building is the most beautiful skyscraper in the city – maybe so, but this is the most iconic. By day impressive, by night stunning bathed in lighting to reflect the season or holiday. We bought our tickets in advance online, well worth doing as it saved 50 minutes queuing to buy them on the day. We did still encounter the lines going through security and waiting for the lifts but avoiding at least one queue, well that makes you feel slightly better. The gift shop and photo exhibit marking the construction of the building in 1931 are worth browsing in, but here it’s all about the views. We emerged onto the outdoor observation deck on the 86th floor to have our breath taken away…. by the crowds. Unbelievably jammed with people, be prepared to push, be pushed and get crushed all at the same time. Our visit was early on a Friday morning – I assume there is never a “good time” to come here. Still, when we did manage to bag a spot at the edge we were rewarded with jaw dropping views of Manhattan. On a clear day apparently you can see for up to 80 miles – as far as Connecticut and Pennsylvania – we were not blessed with a clear day. Still those views of Manhattan and the skyscrapers below are none too shabby. No sign of King Kong but we might just have found the spot where Tom Hanks and Meg Ryan met in Sleepless in Seattle. Back down to earth again and time to take in the building a little bit more. The marble lobby is wonderful and the features of the building are so striking. I came away convinced the interior is every bit as good as the views – maybe better. The striking features and beautiful spaces make you feel you are somewhere special. For me this was the highlight – more so than the exterior and even that view. Just a short walk from the Empire State Building is the New York Public Library – 2 blocks long with more than 2 million books inside, heaven to me. This time I had to content myself with looking from the outside. 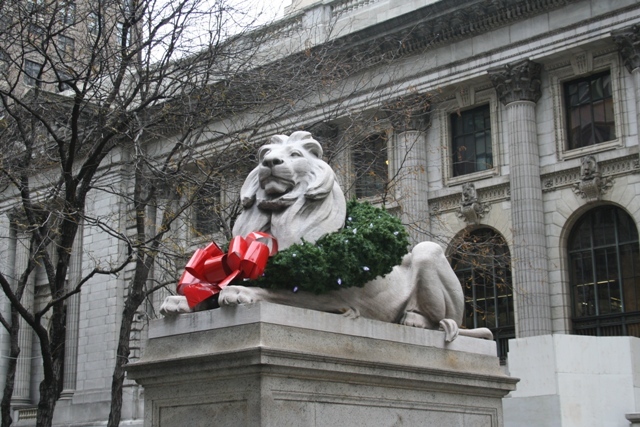 Son, hungry and ready for lunch quite liked the two majestic stone lions out front – Patience and Fortitude, decked out for Christmas in holly garlands. Patience was in short supply from our youngest family member though – until lunch in the form of the biggest pretzel ever arrived. 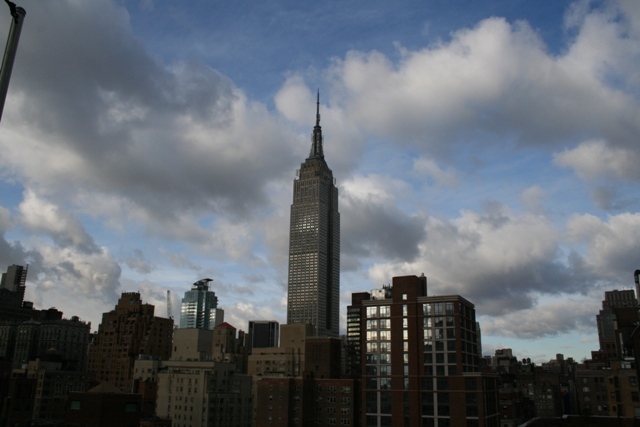 I love the Empire State Building. To me it also has a certain attraction. I must say that I am also very proud that I had the chance to see it from the World Trade Center in 1999. We took pictures with our 3 months old son who was born in the states inside the building – a priceless memory! There’s just something about the Empire State Building isn’t there Erika? Despite being a tourist trap I love it. We were also lucky enough to go up the World Trade Center in 1997 – bittersweet memories! Last year we were standing at the memorial park of 9/11. That was heavy! The memories when we were there the last time, the pics in our head from the attacks and all the tragedies. But I have to say that they made it a beautiful place. Beautiful! I’m so used to seeing it from films that now it’s such a familiar sight even if I’ve never set foot on the American continent. It’s strange isn’t it – the first time I went to New York I felt like I knew it for exactly the same reason. All those films I’ve seen with the city as the backdrop makes it feel so familiar. Maybe that’s why I liked the Empire State Building so much too!! We did the same walk in reverse – past the library to get to the ESB – when we were last in NYC almost a year ago. My second youngest was actually disappointed that there was not a model of King Kong at the top. Ha ha! 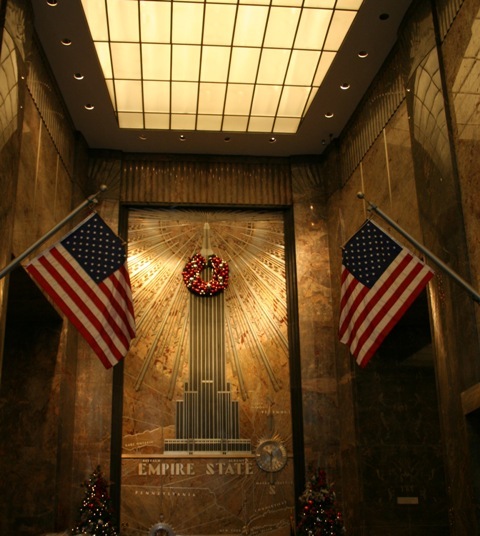 I have been up the Empire State Building at night as well as by day and that provides an entirely different impression. The Chrysler Building is still my favourite NYC skyscraper though. It must have been spectacular at night – would love to do that!! The Chrysler Building was not really on my radar too much before this trip, we had stunning views of it from the roof terrace of our hotel and it is gorgeous. I would love to see it from up high since its roof is its best feature. Yes, the Empire State Building is fantastic. Thanks for the post. My favorite view of it is from the top of Rockefeller Center–another tourist trap but also worthwhile, especially at twilight. You mentioned a good view of the Chrysler from your hotel. Where were you staying? 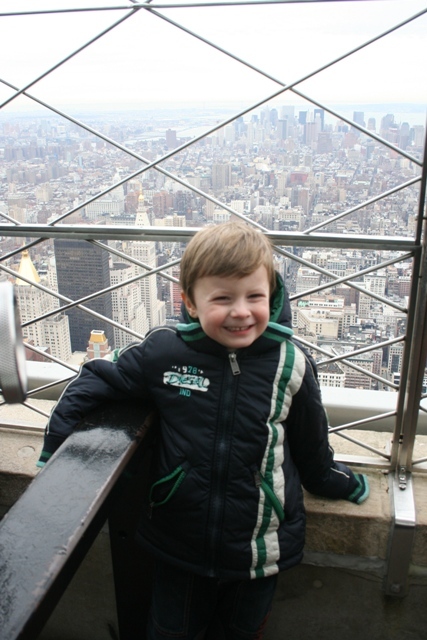 We went to the Top of the Rock by day, it must be amazing at twilight though – maybe next time…. We stayed near Grand Central and had a nice view of the Chrysler from the roof top terrace. On my wishlist: visiting New York! This post makes me want to go so badly! It’s such a great city – buzzing and so much to see and do – we love it. Ha ha – yes for sure!! It was bigger than his head!! Biggest pretzel ever but it was devoured pretty quickly – delicious!! It’s such a great city – so much to see and do – definitely worth a top spot on your list!! 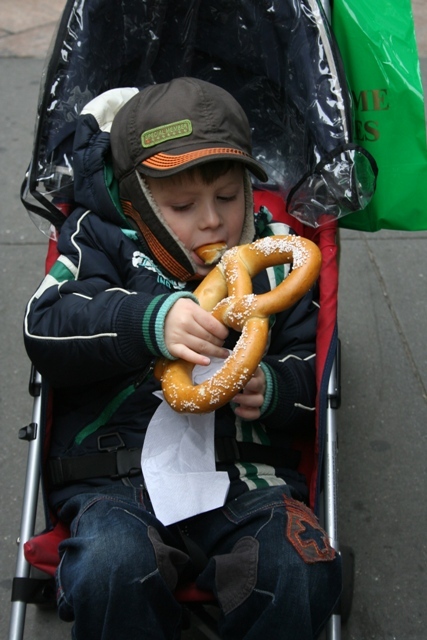 The NYC pretzels are huge and hugely delicious – we sampled more than our fair share of them and they are yummy!! I love the Flat Iron too – one of my favourites! I would love to go inside the library – definitely on my list if we get to New York again. Didn’t know that – so thank you!! I think being smaller would probably have worked well here too Rosemary!! The views are stunning – we had a grey and dull day, imagine what it would be like with clear views!! London was superb – very cold but we went to the theatre and had a great time, we always love the buzz there!! I love the Sleepless in Seattle reference ❤ 🙂 The Empire State Building is a landmark I want to go see and New York is a state I must visit soon. I will definitely be following your New York posts! I love Sleepless in Seattle!! 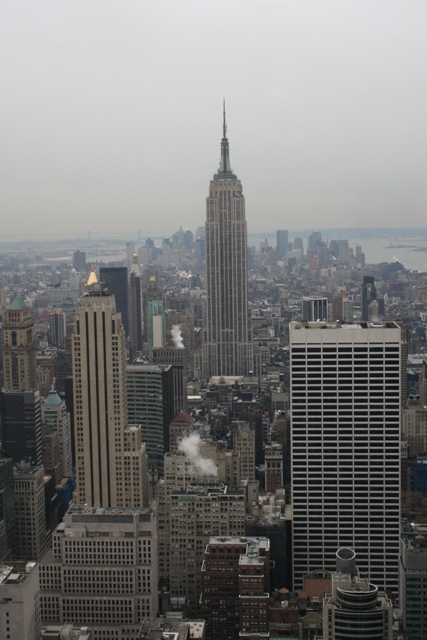 New York is an amazing city – we just loved it and you should definitely visit the Empire State when you get there!! You can’t beat NYC pretzels – we tried a lot of them!! Perhaps alive in my imagination, but it was toy beaver that I’ve had since I was little, however I am compelled now to take him on every travel trip. So I got a good photo of him eyeing up a pigeon at the top of the ESB. Phew!! But that sounds like a well traveled beaver! !